We have scheduled downtime starting at 11pm PDT tonight, August 31st, for product updates. This downtime will last approximately 6 hours. A list of changes will be posted after the release, here on the WGT News blog. The site will be down for approximately one hour tonight, Aug 27, starting at 11PM Pacific Time. We are fixing a few bugs and performing routine system maintenance. Sorry for the inconvenience. Later this month, WGT will be expanding our Tiers and adding new Levels to help make the game more fair and fun for everyone. We'll also be changing our Pro Shop to make our virtual golf equipment available based on your Level and not your Tier. Later this month, all of the current "Master" and "Pro" equipment will be replaced by similar equipment based on Levels. 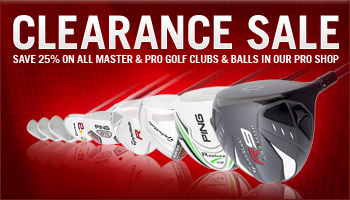 To help players take advantage of this unique last-chance opportunity, we're running a Clearance Sale, reducing prices by 25% on all the Master & Pro golf clubs and balls in the Pro Shop, now thru Sunday, August 22nd. This is the time to play WGT and improve to the Pro or Master Tier, so you can buy a Pro Driver with more distance, a Master Putter with more precision, a full set of Pro or Master clubs, or premium golf balls. When you visit the Pro Shop, you can use WGT Credits in your account or purchase additional credits if needed. WGT Tiers are based on your scores and used to determine who you compete against in tournaments and match play. In order to make competition and matches more interesting and fair, we're expanding from 4 to 7 Tiers, now including Hack, Amateur, Pro, Tour Pro, Master, Tour Master and Legend. WGT Levels are new and are based on completing rounds and interacting with other players. At new Levels, players will be able to unlock new virtual items previously unavailable to them. Levels will make WGT more fun for everyone regardless of their skill, and also encourage players to finish more multi-player games and matches. The WGT Pro Shop will start unlocking all our virtual golf equipment based on Level rather than Tier. As in real life, you may never play as well as a real pro, but that doesn't mean you can't buy the same equipment they're using. However, also in real life, some golf equipment will continue to be designed for beginners and other for experts, in terms of factors like swing meter speed and forgiveness. Note, there won't be any changes to the golf equipment that you already have in your WGT bag, and you will still be able to sell back any clubs to the Pro Shop for credits. Read more on the WGT Forum about Tiers & Levels here. Here are some sweet replays to get you through Monday! PGATOUR.COM is looking for the ultimate fan to help cover the finale of the PGA TOUR Playoffs for the FedExCup, THE TOUR Championship presented by Coca-Cola. THE TOUR Championship, at East Lake Golf Club in Atlanta, Ga., is Sept. 22-26. Fans nationwide can upload a self-produced video or photo essay describing why they are a fan of the TOUR. Contest entries will be posted to PGATOUR.COM/fancontest to be voted on by the public through Sept. 6. At that time, the top 10 entries that receive the most votes will be judged by a PGA TOUR panel and a grand prize winner will be announced on Sept. 10. The winner will receive roundtrip airfare and hotel accommodations in Atlanta for THE TOUR Championship presented by Coca-Cola as well as a media badge good for Wednesday and Thursday of the tournament, where he or she will work alongside a PGATOUR.COM staff member to cover events like the Wounded Warrior Clinic, The First Tee Clinic, practice rounds, player press conferences and first-round play. The winner will post to Twitter via a new fan account, @PGATOURfan, and contribute content to the Live Report on PGATOUR.COM, PGA TOUR Facebook page and YouTube channel during those two days. Do you have a golf obsession? 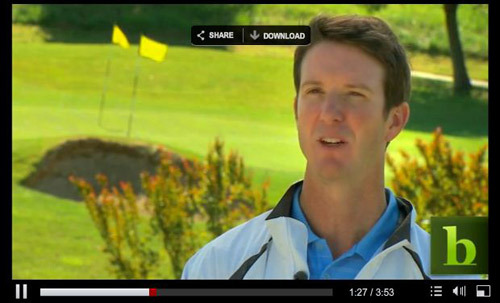 CBS recently interviewed some golf enthusiasts who share their love of the game. This fun video features WGT player Corey Rhodes who plays golf in Northern California and also virtually on WGT at courses like St. Andrews. Thanks Cory. We’re obsessed and hope you all are too. GOLF Magazine has published its 2010 list of "Top 100 Courses You Can Play", and you can experience two of the top ten in HD on WGT--The Ocean Course on Kiawah Island (#4) and Bethpage Black (#6). Wolf Creek Golf Club (#60) and Pinehurst No. 8 (#100) also made the cut. Play them now, it's the next best thing to actually being there! Should Tiger Never Have Played in 2010? These past twelve months have been a year full of firsts for Tiger Woods. First year without a win to this point in the season. Never has he finished a tournament this close to dead last. Woods has never faced as many questions about his golf game. He has never been viewed - as he increasingly is - as a potential liability to the Ryder Cup team. Perhaps the unthinkable 3 wood pop-up at the 8th hole at Sawgrass is the shot that best defines his year. Unbelievable. Surreal. Looking clearly defeated, disinterested, and plain dreadful on the course, it's hard not to wonder if Tiger Woods should have completely shelved the 2010 season. When Tiger Woods made his remarks at TPC Sawgrass on February 19 - the apology that wasn't an apology - he claimed he was unsure of his schedule for 2010. "I do plan to return to golf one day, I just don't know when that day will be. I don't rule out that it will be this year," Woods said in front of the presidential blue drapery in Ponte Vedra. In just a few short weeks, Woods was convinced that he would return to professional golf at the Masters. That comeback bid, though falling short to Phil Mickelson, was solid. A fourth place finish at Augusta showed clear signs of rust, but some of precision as well. The year prior, Woods said he almost won the Masters with a "band-aid swing." He exchanged a figurative band-aid for a busted lip from the November car crash, but Woods looked better on course. The rumors quickly swirled soon after of a pending divorce, an obscene $750 million payout (no way), and continued about break ups with Steve Williams and/or Hank Haney. Woods next played in Charlotte, on a course he loves, in a tournament that could have been his statement to draw eyes back to his on course performance. Instead, he played two terrible rounds, capped off by a second round back nine 43. The 79 in round two remains his worst round of the year and, arguably, the worst round of his professional career. A week later, Woods played middle-of-the-pack golf through three rounds of the Players Championship. On the seventh hole of the final round in which he had no chance to contend for even a six figure check, Woods withdrew on partner Jason Bohn. Bohn said he was surprised Woods' move. Woods said his neck hurt, but the cure was the ever vague "rest" and "massage." Memorial came and went. He was a blip on Justin Rose's victorious radar that week. After Pebble Beach, he would again be a distant haze as Rose won for the second time in 2010. Speaking of Pebble, though, Woods' third round 66 gave fans, media, marketers, and the sport hope that perhaps he was back. Blinded by a score that really consisted of six good holes - and a full dozen good holes for the tournament - Woods had created a mirage. The final round which left him T4, though much further from the title and his A-game than that indicated, brought the state of his game into clearer view. Now 0-fer at two of his favorite venues, Woods had one last chance at the British Open. After the easiest day at St. Andrews in Open Championship history, Woods set himself on a track backwards from that encouraging opening round. Despite good driving that improved upon strides made in Philly at Aronimink, Woods putted more like a 20 handicap than the best in the world. No matter the putter he selected, Woods couldn't sink balls from outside of five feet. And that brings us to Firestone. My God, this was awful. Typically the draw of World Golf Championships events is that there is no cut, but this worked against Woods. He finished next to last by two shots over Henrik Stenson. On Saturday, he hit a dead shank approach to 18. The driver was abysmal all week. At tree-lined Firestone South, that means few greens in regulation. Amid a backdrop that Woods practically owns, he looked pedestrian. If Samson lost his strength from cutting his locks, Woods lost his golf game by flashing a goatee all week. Despite shunning the media for three rounds - including a priceless "f*** no" reply to answering press questions on Friday - he stopped to speak on Sunday. More astounding, Woods made some admissions that he would never pronounce even on his death bed. Asked if he was surprised by his showing this week? "No, it doesn't surprise me at all actually." Perhaps heading off a conversation with Corey Pavin next week at Whistling Straits, he said of his desire to play on the Ryder Cup team, "Not playing like this, definitely not, not playing like this. I mean, I wouldn't help the team if I'm playing like this. No one would help the team if they're shooting 18-over par." Days prior, Woods said he planned on his playing his way onto the team. Not like this he won't. Without a coach, a trusty putter, or much else, the best recourse for Tiger could be playing next week in Wisconsin and then canning it for the year. Woods himself didn't even rule that out. Asked if he was tempted to take a break, he was unclear. "I don't know, I'm just going to be ready for Thursday." Not even wanting to consider that Woods could actually be forced to end his season after The Barclays - a FedExCup playoff event that he previously has had the luxury of skipping - Woods answered a follow up by temporarily regaining his resolve. "I need to be ready by Thursday." A good sound bite, no doubt, but does Woods really believe it? Would he just be happier if he could call it a year? Two final questions were lobbed at Woods, and he gave the same answer to both. "It's been a long year," Woods replied to a follow-up question about his near expectation of failure this week. It has become a weekly ritual to wonder if and when either Phil Mickelson (throat impediment) or Lee Westwood (calf) would usurp Woods' 5+ year reign atop the Official World Golf Rankings. It would be the third time in his career such a transition would happen. The changing of the guard would not be such a bad thing. For Mickelson or Westwood, it would be their first view atop the OWGR. In Woods' case, it might be good to fold camp from the summit. Looking more broadly, this season might have been better if he had not played at all. If Woods has simply waited, he might have been able to avoid the kinds of embarrassment and the bad kind of firsts he has experienced this year. Hank Haney might still be his coach. Steve Williams and he might still resemble a team instead of looking like a separated couple waiting for the divorce papers to get through the courts. Speaking of which, Woods' fix for better golf may well be that he simply is not clearing his body fast enough. But it is more mental than that. Woods needs to get divorced. He needs to settle his life situation. There has to be some quiet element of speculation that Elin may be waiting until the majors are over until the divorce is finalized. The mental effects of the dissolution looming over his head are clear and become more apparent by the day. Tiger Woods is stubborn and very resolute - two qualities that have helped propel him this far in life. They have also lead him to a crushing divorce and a situation in which he has lost all control of his personal life. It has clearly translated back onto the golf course. If Woods had focused on saving his family, or ending it in an efficient way, perhaps 2010 could have turned out better. Yes, Woods would have had zero wins, no more majors, and be no closer to Jack. But he would have saved himself several relationships and some compartment in his brain that has piece of mind about something. Instead, Woods flies to Kohler, Wisconsin, for one final major in 2010, and perhaps no one - not even himself - thinking that it will do him any good. Heads up! We will have downtime on 8/5 at 12:00AM PDT for routine system maintenance. Please make sure you save your game prior to this time. Thanks.